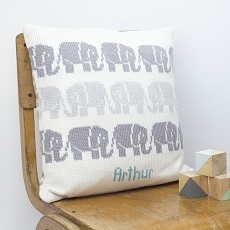 A contemporary personalised knitted cushion featuring an elephants design. Beautiful handmade children’s cushion, featuring a grey and taupe elephant motifs on the front with optional personalised text knitted into the cushion in duck egg blue. Backed with printed elephant fabric on the reverse. The greatest care goes into selecting all components of Smitten products. The woven fabric chosen to back this knitted cushion has been handpicked to compliment the motif design and yarn colours shown on the front. Smitten cushions measure approximately 40cm width x 40cm height. Perfectly sized to add comfort to the nursing chair, bed or for cuddling up on the sofa.